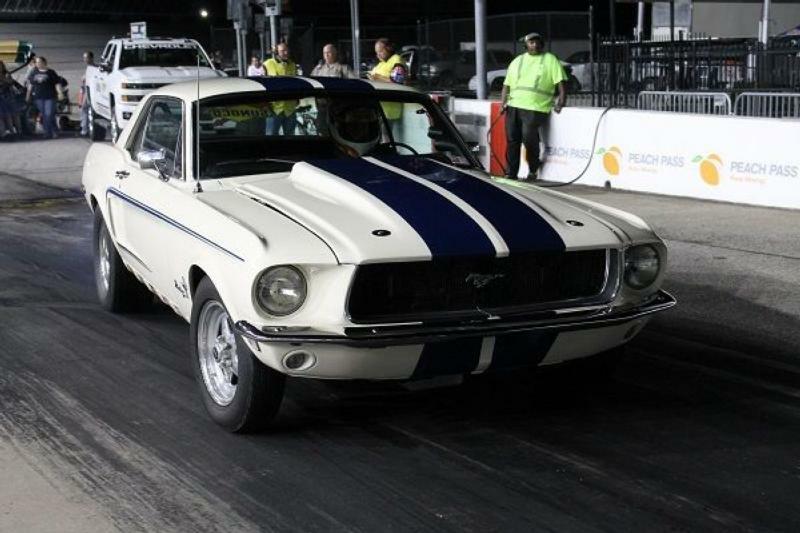 The pit lane drag strip roared to life under the lights as drivers vied for championship points for the third time this season at the O'Reilly Auto Parts Friday Night Drags. Eighteen racing divisions went head-to-head in one of the largest organized street-style drag racing series in the nation, with single-elimination competition determining each winner. Vehicles ranging from souped-up muscle cars all the way down to factory cars and daily drivers saw action. Kelly Morgan of Jonesboro and his 1968 Ford Mustang continued his dominance in the Street Modified division as he notched his second win of the points season. "The car just ran pretty good tonight," said Morgan following his final round victory. "It was all tuned up and ready to go." Morgan defeated the 2005 Ford Mustang of Nick Eversoll of Newton in the final. And despite the rain out last week providing additional time to prepare, Morgan kept to his traditional pre-race preparation routine. "I don't do anything [to prepare the car during the week]," Morgan explained, "I put everything off until Friday and do everything Friday afternoon." It seems to work for Morgan as he also found victory lane in both of the season opening non-points races on May 11th and May 18th. In the QuikTrip Pro Class, Kevin Mayo of McDonough remains unbeaten in the points season with his third consecutive win. The 1969 Chevrolet of Mayo tore off the line in the final and left no doubt as he defeated the 1970 Chevrolet Nova of Hamptons' Mark Buersehig. Brandon Sampler of Griffin also notched his third consecutive win in the Street Performer class behind the wheel of his 1995 Chevrolet S10 to open up a wide margin atop the standings. Sampler defeated Charles Specht of Jonesboro in the final round for the second consecutive week. Other notable winners include McDonough's Earl Blanford and his 1968 Ford F-150 in the Starfire Automatic Gates Truck division and Chandler Brewer of Peachtree City on his 20189 KTM 690 Duke in the US Marine Corps Motorcycle division. Atlanta Motor Speedway's O'Reilly Auto Parts Friday Night Drags & Show-N-Shine returns to action on Independence Day for the Papa John's Pizza Fireworks Extravaganza. Next week for Week 8 action, the Series will run a special edition on Wednesday, July 4 and will NOT race on Friday, July 6th. Grandstand gates open at 6:30 p.m., and nightly drag race eliminations start just after 9:00 p.m.